The Happy Half Wit, manufactured by International Fiberglass, was originally called Mortimer Snerd after ventriloquist Edgar Bergen's puppet. 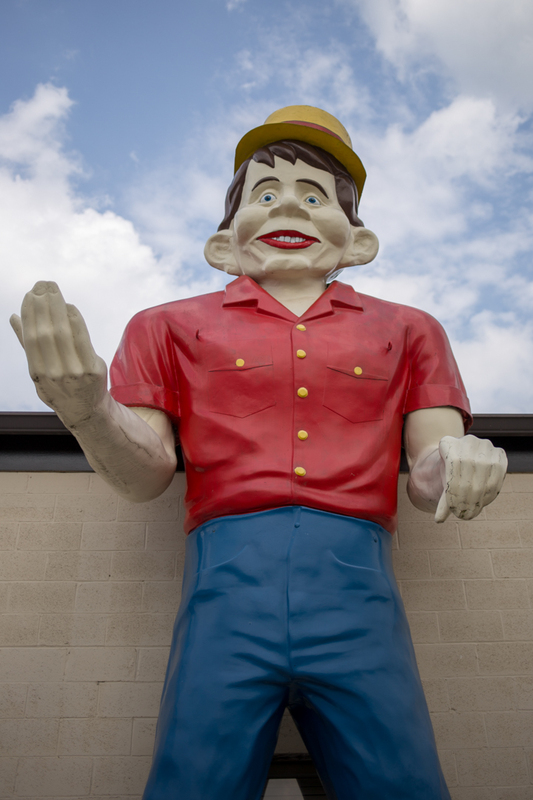 The Half Wits have faces that resemble Alfred E. Neuman of MAD magazine and they are a variant on the classic Muffler Man (others include Cowboys, Indians, Texaco Big Friends and UniRoyal Gals). The Half Wits (a name coined by Roadside America) were produced for mini golf courses along the east coast and Ohio. They came in one of two color schemes: yellow shirt with suspenders and blue pants (with patches) or red shirt and yellow suspenders with blue pants (no patches). They also have one of two hat styles: a round farmer-type hat or a conductor hat that was made by modifying the round style. The Half Wits are much more rare than the traditional Bunyan Muffler Men and I just recently met my third one (my first was at the Magic Forest in Lake George and my second was at Mr. Bill’s in New Jersey). There were once two Happy Half Wits on the boardwalk in Seaside Heights, NJ and both were damaged by Superstorm Sandy in 2012. In 2014, one was restored and moved to Oaks, PA where it currently sits outside of Arnold's Family Fun Center. The Arnold’s Half Wit lost his suspenders in the renovation, but he’s still the best Half Wit I’ve seen. 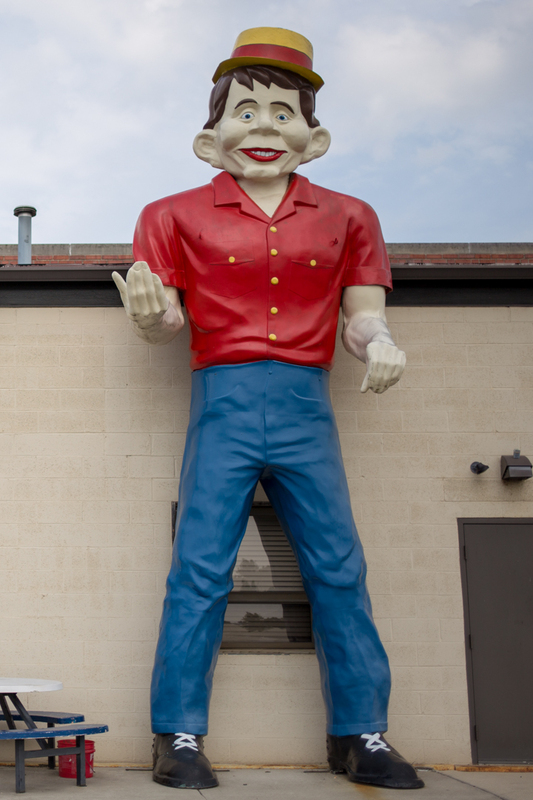 While the one at Mr. Bill’s does have the suspenders, his complexion is a bit off—and the Amish-style Half Wit at the Magic Forest begs many, many questions. While Arnold’s Family Fun Center might not be worth the price of admission—one review is titled “What a dump!”—luckily you can see their Happy Half Wit (and his giraffe pal) free of charge.